Nightcourses.com is Ireland’s largest Course Finder. We have been the leading website in Ireland for information about evening classes, part-time courses and adult education courses for more than 15 years. Since our launch in 2000, we have referred tens of thousands of enquiries from course-seekers to course providers and colleges nationwide, creating happy solutions for course seekers and substantial course revenue for course providers. 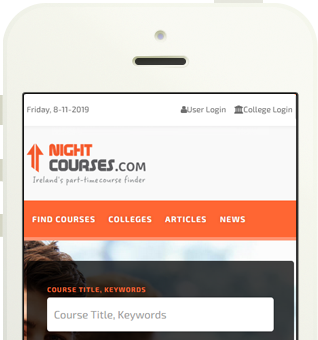 Nightcourses.com offers colleges and course providers the most cost-effective way to promote your courses to prospective students in Ireland, with multiple packages available.